OK, its a bit of a pun! Quite simply, Mild West is the medium dry version of Wild West. The fruit for Mild West in 2012 came from the Roger's Orchard, just north of Bridport and another orchard in Somerset was used for its bitter sharp apples. These have made the cider less drying and tannic - giving it a more lauid back taste. Also, because the sugar levels in the fruit were lower than normal, some Egremont Russet (from Hill Farm, Hampshire) was used to provide an acidic base in order to protect the cider. 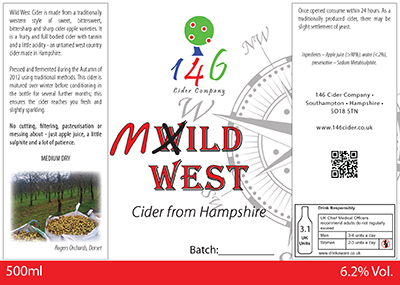 The cider was pressed during November and December of 2012 and blended during fermentation (using natural yeast).